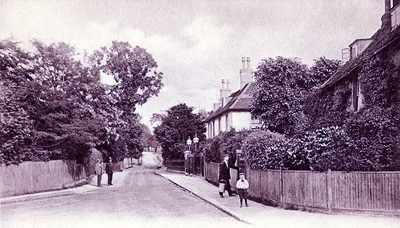 Until the railway arrived, Orpington, now in the London borough of Bromley, was a rural Kent village noted for its hop gardens and orchards. Construction of the London, Chatham and Dover Railway meant that the nearby commercial centre, St Mary Cray, expanded and agricultural Orpington provided the land for housing. In 1841, Orpington’s population was 754. Post-railway, in 1884, it was 3,050. By the outbreak of the First World War, it was 6,000. Orpington would become a vital part the war effort, as a transport link, defending London and providing hospital care for those wounded. This is the story. All through the night of 4 August, 1914 — hours after Britain had declared war on Germany — and for many nights that followed, express trains thundered through Orpington station at 10-minute intervals, carrying the British Expeditionary Force to the coast. Soon the traffic in the High Street grew noticeably less, horses became rare, and cars, except those used for military purposes, were few and far between. Young men of military age were leaving in large numbers for the army or the navy or to engage in munitions work. A company of volunteers was formed under the command of Dr A Tennyson-Smith. Recruits were confined to men over the age for military service. A shooting range was set up, and four drills were undertaken weekly. The volunteers later became part of the county organisation under the title of the Kent Fencibles. Battalions were formed, the local contingent forming C Company of the 7th Battalion West Kent Volunteers. They were eventually incorporated in the armed forces as the 3rd Volunteer Battalion Queen’s Own (Royal West Kent Regiment). Route marches were undertaken and trenches dug at Knockholt and Wrotham as part of the scheme of defence for London. Long-range rifle firing, bombing, and machinegun practice were also undertaken, and anti-aircraft guns were manned and worked in the defence of London against hostile aircraft. When the Home Office appealed for special constables, 30 men from Orpington and Cray answered the call and were sworn in at Bromley police court to the Metropolitan Special Constabulary. This number increased to 60 by the end of the year. The specials were called out to stand by in case of need during air raids. No bombs fell directly on Orpington, but several exploded in nearby fields and orchards, and the district was constantly hit by falling shrapnel. In October, Orpington village hall was converted into a Voluntary Aid Detachment (VAD) hospital. The first convoy of wounded soldiers arrived soon afterwards, transported from the station by Royal Army Service Corps Volunteers in motor cars that had been lent by their owners. From then, in all weathers and at all times of night and day, no call came for the transport of wounded men that was not answered, and every provision was made to meet the immediate needs of the men and to provide for their comfort. Many wounded Belgian soldiers and refugees arrived, and the High Street was alive to the sound of French and Flemish voices. In December, Orpington and Cray’s Christmas comforts fund was organised, and a parcel sent to every man from the district serving at the front or at sea, and to those who were prisoners of war. The parcels, packed and addressed by volunteers, contained pipes, tobacco, cigarettes, socks, scarves, mittens, handkerchiefs, towels and books, and were sent to men stationed in Salonica, Egypt, Mesopotamia, China, India, and France, and to men in the Navy. In the spring of 1915, the Royal Defence Corps took over guard duty of Orpington waterworks from special constables. The specials then took charge of the gasworks at St Mary Cray. That year, Orpington and District Railway Ambulance Corps, comprising 50 men, was formed, and £150 was raised by public appeal for uniforms and surgical equipment. The corps met every week for instruction in first-aid, stretcher drill, and transport. Duties included staffing the dressing stations at Orpington, St Mary Cray and Farnborough during air raids, unloading the hospital trains and transferring the wounded to ambulances. When a hospital train left Dover, the corps was advised by telephone, and met the train. A hospital train contained from 120 to 160 cot cases, and all these would be cleared within 45 minutes. The corps held the record for speed of working on the entire South Eastern and Chatham Railway. By June, VAD Hospital No 108 (Orpington) had one of the best operating theatres of all VAD hospitals in Kent. During most of 1915, patients came in direct convoys, usually arriving at midnight from the battlefields of France and Belgium covered with mud, utterly worn out, and many severely wounded. On convoy nights, and for several days after, the strain on the staff was severe. The standard of cleanliness at the hospital was high and no speck of dust was allowed to remain long. Christmas gifts were sent with the help of subscriptions from residents, and parcels were dispatched to nearly 500 men. Throughout the years 1915-18 the sound of the guns in Flanders was heard in Orpington, 120 miles away. With favourable weather, the sound of individual guns could clearly be distinguished, but for the most part the impression given was of a continuous series of dull thuds punctuated by greater or lesser intensity. The firing was audible day and night, sometimes continuously for several weeks, and often loud enough to rattle windows. In February, 1916, Ontario Military Hospital, built on high land on the outskirts of Orpington, was opened by Andrew Bonar Law, the colonies secretary and future prime minister. 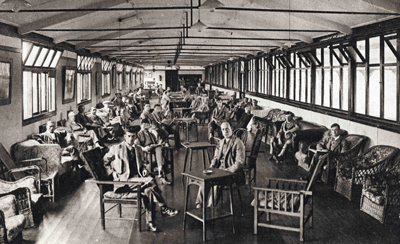 The hospital, completed in four months, was financed by the government of Ontario in Canada with money surplus from its war relief fund, and comprised 20 wards that could each accommodate 52 patients. Most were Canadian, but troops from Britain, Australia, New Zealand and Newfoundland were also treated there. By 1916 food was becoming scarce and many people in Orpington, as they were throughout the country, were growing vegetables on plots of 10 rods (165ft) that were allotted by the parish council or sometimes by private owners. A campaign was organised to reduce bread consumption and to encourage the use of wheat substitutes, and although most inhabitants were employed in agriculture or other occupations involving manual work, bread consumption dropped to 4lb per head weekly. In March a soldiers’ club was formed by local churches. The Baptist Lecture Hall was made available and furniture, billiard and bagatelle tables, games and books lent to the club. Flags, decorations and a large stock of writing materials were also supplied. It was up and running within 10 days, furnished and fitted with an excellent canteen. Attendances reached 2,000 weekly. Members of the Honourable Artillery Company, the Welsh Guards, and the London Regiment stationed at Green Street Green, two miles from Orpington, used the club frequently. Every afternoon a procession took place between the Ontario Military Hospital and the club, with a stream of wounded soldiers on crutches, in wheeled chairs and carriages, leaning on sticks or on a comrade’s arm. In the summer, the special constables organised a sports day in a large field in St Mary Cray to entertain the wounded soldiers. More than 600 men were invited to tea and £80 was handed over to the local hospital. Christmas parcels were sent to more than 500 soldiers. Air raids on the London area were becoming frequent in 1917 and batteries of anti-aircraft guns and large numbers of searchlights were installed in the Orpington district. On one occasion an aerial torpedo fell in an orchard and stripped a number of apple trees. The next morning the apples were collected and sold at Covent Garden for £2 10s. The aerial fight that followed the daylight raid by aeroplanes on London on 9 July was clearly seen from Orpington, and on several nights that year the vibrant hum of Gotha bombers was punctuated by the rattle of machinegun fire as airmen fought. The air barrage was at first described as “magnificent”, but the noise was intense and when continued for five nights in succession, as it was in September, it was voted a nuisance. Two German airships were brought down in flames in the district, both seen clearly from Orpington. The Schütte-Lanz SL 11 (similar to a Zeppelin but built by another manufacturer) that crashed at Cuffley, Hertfordshire, passed over Orpington about 20 minutes before its downfall. More than 750 wounded soldiers were entertained by the special constables at their summer sports event and £140 was contributed to hospital funds. National War Bonds were instituted in October and £400 was subscribed to the Christmas Comforts Fund. A total of 534 parcels were dispatched and thank you letters received from 300 recipients. To all wounded men in hospital a gift of 7s 6d was made in 1917; this was increased in 1918 to 10 shillings. The administration of the public funds voted by parliament for the relief of dependents of soldiers and sailors was undertaken in Orpington by Miss Howard and Miss Delves, and in St Mary Cray and St Paul’s Cray by Miss Berens. The administration of public funds for the relief of disabled soldiers and sailors was undertaken by Mr Guilford Lewis. From 1918 this work was administered by Mr Herbert Virtue, and grew to large proportions. During the war savings campaigns of 1918 enormous sums were raised with active propaganda. Lectures were given and open-air meetings were held throughout the district to explain the aims and methods of war saving. During War Savings Week, the district was assessed on the basis of population, and was asked to contribute its quota of £15,000; in fact it contributed £50,000. Contributions from the district to the 5% war loan aggregated £100,000 and the sales of National War Bonds furnished a further £150,000. A summer sports event was cancelled because of rationing and transport difficulties. When Captain Tennyson-Smith was asked to form a field ambulance, the medical men of the district answered the call. Thirty names were put forward and first aid classes were held at Orpington and St Mary Cray. Members were getting ready for their first examination when the armistice was signed. Throughout the war, shrines were placed in the road outside local churches — All Saints’, St Andrew’s, St Mary’s and St Paul’s – and the names of the fallen were added as casualties became known. A memorial to the 111 men who died in the Great War was built in Orpington High Street in 1921. Memorials were also placed in Chislehurst Road and St Mary Cray schools and in Nash and Joynson’s paper mills.